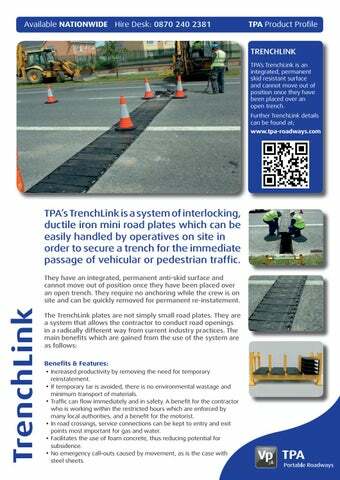 TPA’s TrenchLink is a system of interlocking, ductile iron mini road plates which can be easily handled by operatives on site in order to secure a trench for the immediate passage of vehicular or pedestrian traffic. • Increased productivity by removing the need for temporary reinstatement. minimum transport of materials. Traffic can flow immediately and in safety. A benefit for the contractor who is working within the restricted hours which are enforced by many local authorities, and a benefit for the motorist. In road crossings, service connections can be kept to entry and exit points most important for gas and water. Facilitates the use of foam concrete, thus reducing potential for subsidence. No emergency call-outs caused by movement, as is the case with steel sheets. wastage and minimum transport of materials. the contractor who is working within the restricted hours which are enforced by many local authorities, and a benefit for the motorist. entry and exit points, most important for gas and water. emergency call-outs • No caused by movement, as is the case with steel sheets. stillage, by pick-up, trailer or truck. traffic delays, • Minimal resulting in reduced vehicle emissions. temporary tar, no • No transport, disposal or recycling costs. © 2017 TPA Portable Roadways All Rights reserved Specifications are subject to change without notice Trademarks are the property of TPA Portable Roadways or their respective owners.